Can we talk about date nights? Even though we don't have kids yet, we still really enjoy date nights. We are frugal people, so we don't eat out a lot. Because I've been working so much for the last few months, we have been ordering food a lot, which still costs money, but we still haven't eaten out that much. The other day, it was my sister's birthday. My family was getting together at home (about 4 hours from here) at a Mexican restaurant. When I heard that, I wanted to go to a Mexican restaurant, too. I'm all about supporting small, locally owned businesses over chains, generally. I guess it's because I come from a small business family. And I love authentic Mexican restaurants too, because the food is generally really good and the service is really fast. Notice I used the word "generally" a lot up there in that last paragraph. Because Friday night, I put on earrings, and a pair of boots, and rushed Michael out the door and into the van and we were off for a fun date night. Then, we opened the door to this local Mexican restaurant. I don't even remember what it is called. I had been wanting to go there for a little while, I would always see it when I was getting gas across the street, and thought, "we should go there sometime." We walked through that door into a dark cave! I mean complete darkness. Like power outage darkness. The only light was from this giant projector screen that was playing something about Chernobyl and nuclear disasters on the Spanish National Geographic Channel. I. am. not. even. kidding! Michael even said it felt like we were awkwardly at someone else's house, forced to watch what they had on TV when we came over to visit, and they were ignoring us. Then our non-English speaking waitress came over. Not a problem, because I'm married to the guy who once lived in Texas and regularly practices his Spanish with our apartment maintenance guys. Also, par for the course at a Mexican restaurant. Authentic, cool. We watched the Chernobyl documentary in the darkness, and sipped our not-good/so-from-a-mix margaritas, and laughed uncontrollably at our horrible date night. I was just thankful this wasn't our first date! 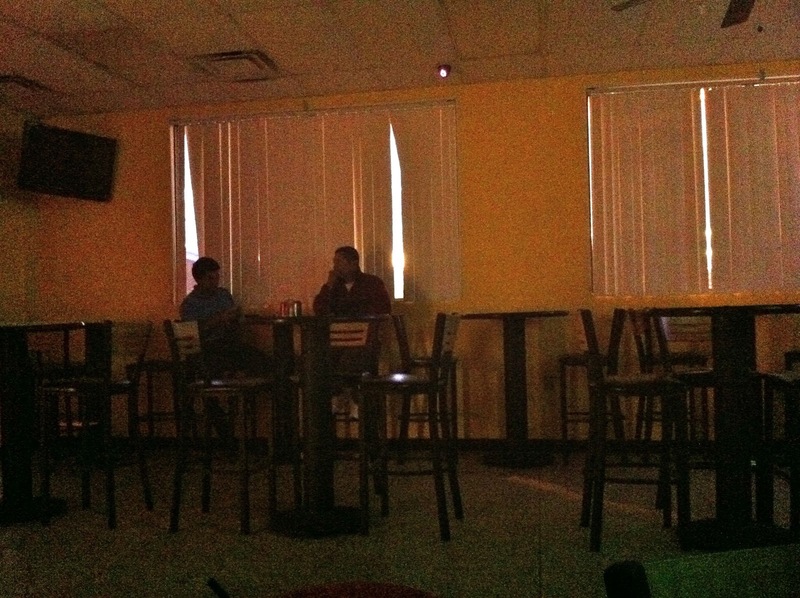 There were two Mexican guys also in there, drinking canned Sprite and Coke. Yes, I said canned. What in the world? At some point, Michael asked the waitress if we could stop watching nuclear disasters and change the projector (a.k.a. 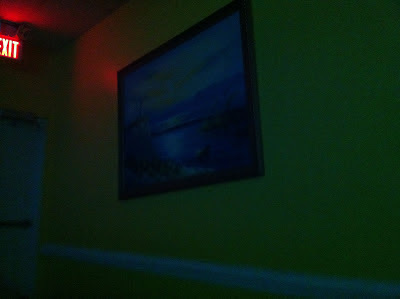 the only light in the room) to sports. So, now we had soccer. In Spanish. And the canned soda drinking guys left. How romantic! The whole restaurant to ourselves! After what felt like forever, our food finally came. It was okay. I ordered enchiladas, and they were crazy hot! I like spicy food, but I couldn't handle them with my "margarita." Michael had a chicken burrito, and his food was good! So, we shared his. I wanted some water, so Michael went to get the waitress to get us some water. Then she brought us two Deer Park bottles of water. And plastic cups with straws that had the wrappers still on the tops of the straws. Very nursing home chic! We just kept looking at each other, like "are we on Candid Camera or something?" 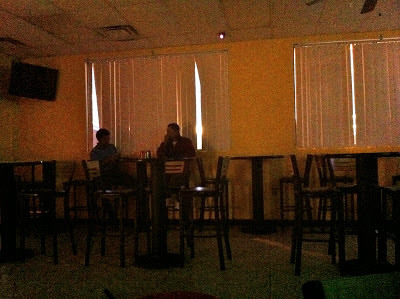 Then, out of nowhere, a lady came in and turned the juke box up to like 1,000, playing some Latin dance music. So, we're sitting there drinking our bottled water out of our plastic cups with straws, we can't see each other, and now we can't hear each other. We waited for our check. It came and it was like $41.00!?!? Flabbergasted, I signed the receipt, and we went back out into America. Wow. We went to a movie after that. And that part of the date was great! We saw "Argo," and it was REALLY good. Thank you, "Argo" for saving our date night! Have you ever had a horrible date? Let me hear about it so we know we are not alone! Wow. Just wow. I am sitting over here laughing out loud. That was too much.